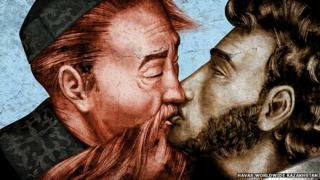 An advertising agency has been handed a large fine for a poster of revered Kazakh bard Kurmangazy locked in a passionate kiss with Alexander Pushkin, Russia's national poet. Havas Worldwide Kazakhstan says it can't pay the 34 million tenge ($186,000; £115,000) fine, and plans to appeal. The agency's general director says the ruling is "nonsense". "Not one of the 34 plaintiffs appeared in court. The whole hearing was marred by procedural violations," Dariya Khamitzhanova tells the Kapital.kz news portal. Havas has also been ordered to issue an apology in the national media, Tengrinews agency reports. The poster appeared in social media in August, enraging anti-gay activists who complained to the police that it insulted Kazakhs and Russians. Thirty-four staff and students of Kurmangazy Conservatory, in the southern city of Almaty, filed a suit last month demanding a million tenge each in moral damages. Opponents allege that the poster was made to advertise a gay club on the corner of Kurmangazy and Pushkin Streets in Almaty. But Havas insists it was just an entry in an advertising competition in neighbouring Kyrgyzstan, and never intended for public use. Homosexual acts between consenting adults are legal in Kazakhstan, and Almaty is unusually liberal by Central Asian standards, but the country has seen a hardening of attitudes of late. Some government MPs have called for a ban on the "promotion of homosexuality", along the lines of a recent Russian law, or even the outlawing of homosexual acts altogether.